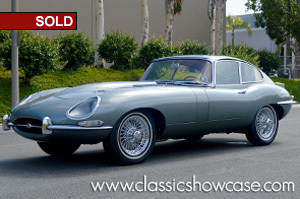 (SOLD) A complete concours quality award winning restoration has just been completed by a Jaguar aficionado and certified Jaguar concours judge. The utmost attention was spent on every detail of the ground-up, nut-and-bolt restoration, including a complete stripping and bead blasting of the body and sub-frame, triple-plating of chrome trim and making sure every part is factory original and correct. The car was very original, correct and completely rust free when it began its restoration. The restoration included a complete dis-assembly of the car with the components either refurbished, or replaced, keeping true to the original as much as possible. The interior is 100% authentic with Wilton Wool carpets, English Connolly leather, English Rexine vinyl, English Ambola, Hardura, Moquette, wool-cloth headliner and natural jute under felt. The car is extensively detailed top to bottom, and underside, with every factory decal and marking down to the correct color of factory marking paint on the rear springs, and the correct battery cap color. The car is gorgeously finished in the original Opalescent Silver Grey and correct red leather interior. Restored to award-winning standards, it still retains its original cylinder head, block, and gearbox. The car has excellent provenance, and a superb level of completeness. 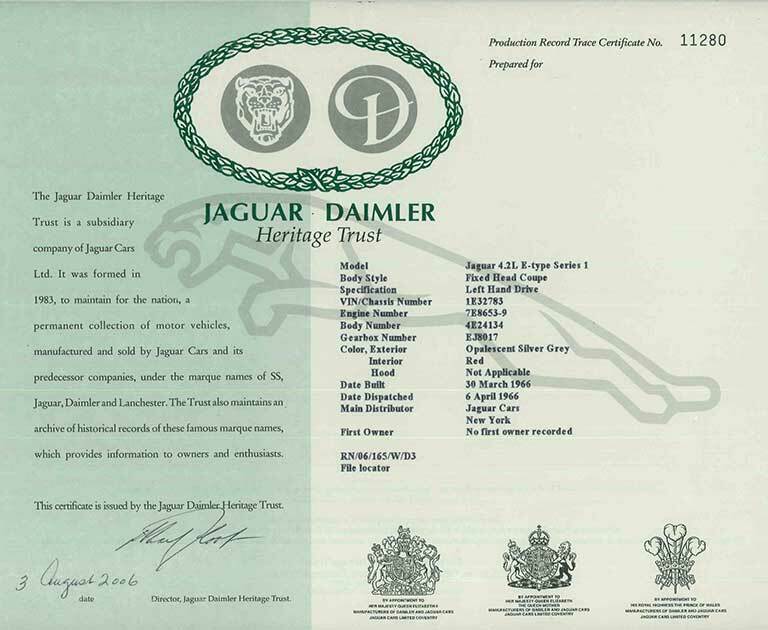 This Jaguar is extremely well-documented, with a thick file of restoration invoices, judging sheets; an issue of the club publication in which it was featured, photos of the restoration process, authenticity documentation, and a Heritage Certificate. In the extensive research and documentation that was performed, there is a chain of ownership, detailed factory build notations, and even trips to England were made to locate hard to find parts. This e-type has only been driven on and off an enclosed trailer to show it in a JCNA sanctioned Concours de’ Elegance, in the Championship Division, where it scored 99.93. The point deductions have been corrected. The car had been stored in its own climate controlled space that is heated/cooled, and dust and moisture managed. It is restored to an exceptionally high level of authenticity, and with its original exterior and interior colors, and even the finishes, including chrome and glass, have been done to a very high show quality level. This stunning Jaguar is a wonderful example for a high-end collection, or would make a great concours show car. It is ready for the 2016 concours season, and has already shown it’s a contender. The Jaguar E-Type, unofficially known as the “XKE”, was considered “the most beautiful car ever made” by Enzo Ferrari, who wept when he first saw the car. Revealed for the first time at the Geneva Auto Show in March 1961, the world was shocked by its stunning looks, exhilarating performance and affordability. After more than 50 years, the E-Type continues to stand out as one of the most beautiful and recognizable automobiles in the world and is considered the epitome of Jaguar’s exquisite feel for body design. Designed by Malcolm Sayer, a former aircraft engineer, the car is literally a work of art having been placed as the only automobile in the permanent exhibit of The Museum of Modern Art in New York City. Sayer used scientific calculations to create the beautiful elliptical E-Type form. Of enduring quality, the E-Type was and is one of the most appealing, intelligent, elegant and intoxicating sports cars ever made like nothing before it, or would ever come after it. More than a half-century later, the E-type remains the gold standard for automotive design. The September 2015 edition of Road and Track had this to say about the E-Type Coupe. “Five-plus decades on, it remains the aspirational British supercar. E-types appear in every top collection, including the Museum of Modern Art’s, and their values still defy the laws of supply and demand. Some of the features of this model are covered headlights, toggle switches, full instrumentation with styling and a design that was way ahead of its time with center console, and arm rests. Other features of this Series 1 are its steep windshield and tail lights, which are placed above the bumper line in the rear deck. Similarly, the parking lights are above the front bumper line in the front fenders. In 1964 when the 4.2 was tested, fuel consumption was rated road reported at 22 MPG, and a top speed of 140 MPH.